The National Zoo is preparing to send one of its superstars, giant panda Bao Bao, to China next week. But her fans still have time to say goodbye. WASHINGTON — The National Zoo is preparing to send one of its superstars, giant panda Bao Bao, to China next week. But her fans still have time to say goodbye. “She was born and raised here and, you know, we kind of got a little attached so we wanted to say goodbye,” said Greg Douds, who is visiting with his wife from Pennsylvania. They made sure to visit Bao Bao before she flies FedEx to China next week. “There could be worse ways to travel! It should be first class though,” he said. On Feb. 21, Smithsonian National Zoo Asian Trail Curator Michael Brown-Palsgrove said her keepers will put the 3-year-old giant panda in a crate she can stand in for the 16-hour flight. “The keepers will have bamboo for her as well as her favorite treats — apples, sweet potatoes and also her leaf-eater biscuits as well,” he said. While there is no in-flight movie for the panda whose crate will be marked with her name, she won’t have to deal with jet lag once she lands. “She’s not as tied to a night cycle as we are. She sleeps throughout the day. I don’t think the time change will have as much as an effect o n her as it will on the keeper and veterinarian traveling with her,” he said. Bao Bao’s keepers will teach their Chinese counterparts the physical signs they use to communicate with the panda. The signals will eventually pair with verbal commands. “Eventually, yes she will learn Chinese,” Brown-Palsgrove said. Visitor Nancy Connors says she thinks Bao Bao’s departure is for the best. “I heard the trainer say she has been away from her mother for over a year. You know, she has been on her own here. Why can’t she be with other animals? And why just be confined and really only taken out for breeding purposes? I don’t see any reason to deny her a better life,” she said. Other visitors disagree, but the return of Bao Bao to China is part of a predetermined contract between the U.S. and China that is unlikely to be broken. To kick off the farewell, the Zoo’s panda team is also taking over the @Smithsonian Instagram account to share a behind-the-scenes look at a day in the life of a giant panda keeper. Tune in to the Smithsonian’s National Zoo’s Facebook page to learn how and why keepers engage giant pandas and other animals in enrichment activities, like painting, to stimulate natural behaviors. Visit the zoo or tune in to Panda Cam 1 to see Bao Bao receive a “dumpling.” In honor of Bao Bao, the Embassy of China is serving dumplings to panda fans beginning at 10 a.m. In China, dumplings are a must-have food for festivities and a popular food for bidding farewell to loved ones before they leave home. The shape of dumplings also resembles an ancient gold-bar, or “yuan bao,” in Chinese which represents perfection and completion. Visit the zoo or tune in to Panda Cam 1 to see the panda team give Bao Bao a special Smithsonian-themed enrichment that represents the zoo’s global cooperation to save species. Curious about giant panda conservation and the science behind it? Join experts for an online Reddit AMA chat on giant panda reproduction, biology and habitat. Visit the zoo or tune in to Panda Cam 1 to watch as Bao Bao receives special themed enrichment acknowledging the 30,000 FONZ member families who support the zoo’s commitment to animal conservation and wildlife research. Visit the zoo or tune in to Panda Cam 1 to watch Bao Bao enjoy her favorite enrichment items, picked out by her keepers. Tune in to see what they are! Tune in to the Smithsonian’s National Zoo’s Facebook page to learn how to make giant panda-inspired crafts with the FONZ education team using items you may already have at home. Visit the zoo or tune in to Panda Cam 1 to watch Bao Bao enjoy a heart-shaped ice cake made by the zoo’s Department of Nutrition Science. The cake represents global panda fan love. Fans support the zoo’s conservation work to study, care for and help save the giant panda and its native habitat. ​Visit the zoo or tune in to Panda Cam 1 to watch Bao Bao enjoy a “precious treasure” box filled with treats. Visit the zoo or tune in to Panda Cam 1 to watch Bao Bao enjoy a celebratory ice cake treat crafted with her daily food items and prepared by the zoo’s Department of Nutrition Science. Tune in to the Smithsonian’s National Zoo’s Facebook page to get an inside look at the panda cam control room and meet a specially-trained FONZ volunteer behavior-watcher. Visit the zoo or tune in to Panda Cam 1 to watch Bao Bao enjoy peach-themed enrichment. 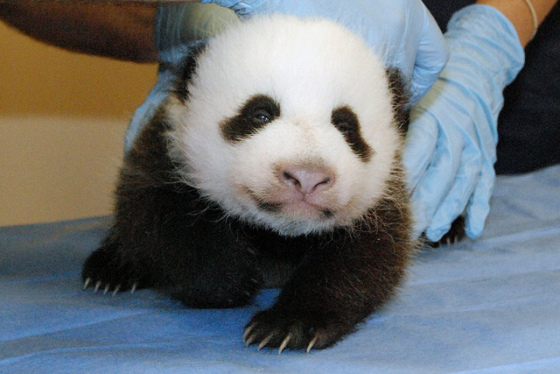 In August 2014, the zoo and the Embassy of the People’s Republic of China celebrated giant panda cub Bao Bao’s first birthday with a Zhuazhou (dra-JO) ceremony. During a traditional Zhuazhou ceremony, symbolic objects are placed in front of a baby. The item that the baby reaches for first foretells something about his or her future. Three posters with symbols painted on them were placed in Bao Bao’s yard. Bao Bao chose the peaches first, which means she will live a long life as an ambassador for panda conservation. Tune in to the Smithsonian’s National Zoo’s Facebook page to get a behind-the-scenes look at how the team is getting Bao Bao ready for her trip to China. What do you pack for a panda? Visit the zoo or tune in to Panda Cam 1 to watch Bao Bao enjoy a stunning ice cake in the shape of a Chinese pagoda. The cake celebrates of 45 years of collaboration with Chinese colleagues to study, care for and save giant pandas in their native habitat. Visit the zoo or tune in to Panda Cam 1 to watch as Bao Bao receives a “suitcase” with symbols of her hometown and a symbol of her future home in China. Please note: The zoo will be closed to the public on Feb. 21 from 8 a.m. to 12 p.m. Please tune in to the Smithsonian’s National Zoo’s Facebook page to watch live as Bao Bao departs. Tune in to the Smithsonian’s National Zoo’s Facebook page to watch as Bao Bao departs from the Zoo. Tune in to the Smithsonian’s National Zoo’s Facebook page to watch as Bao Bao departs Dulles International Airport on the “FedEx Panda Express,” a custom-decaled 777F aircraft.